I've got to do a project which uses a servo to drive a turntable. How much I adjusted the angle, the servo seemed to shift every time it spinned. For instance, the 0 degree angle was getting a bit bigger. I think it is caused by the imprecise PWM control of the Arduino or the bad translation using, I think, the map() function. Could you fix this issue in code, or the servo doesn't work properly. I observed that every servo (that I've tried) creates a buzzing noice for angles bigger than 170 degrees. Edit: Should I try with a more powerful Arduino, like the Mega, which I think will be the perfect option having more GPIO than the UNO. Try to use myservo.writeMicroseconds(x) function. For standard servos the value of parameter x is between 1000 to 2000 for 0 degree to 180 degree rotation. But you know all servos are not manufactured perfectly. Thats why servos can response to 700 to 2300. At first you have to verify the minimum and maximum responding values then use it. You can use map() for easy coding. Servos will vary based on brand; in addition each servo is going to have some individual variance. So one has to characterize the servo, and discover what the proper control values are. Once the control values are established these are used to initialize the library so angular control will be accurate. I have found that errors in repeatability, like this, are usually found in the mechanism the servo is driving, especially the connection between the servo and the driven mechanisms. Check the connection for slop, see if everything is tightened properly. I observed that every servo (that I've tried) creates a buzzing noice for angles bigger than 170 degrees. The typical maximum range of a servo is 160-190 degrees of rotation. The noise you are hearing is the servo trying to drive the motor to set the angle, but it is stalled as it can't turn that far. Should I try with a more powerful Arduino, like the Mega, which I think will be the perfect option having more GPIO than the UNO. If you need more features you can move to the MEGA, i.e. you need more PWM channels, and the servo library reduces PWM pins from 6 to 4 on the 328p. Another example could needing more timers. 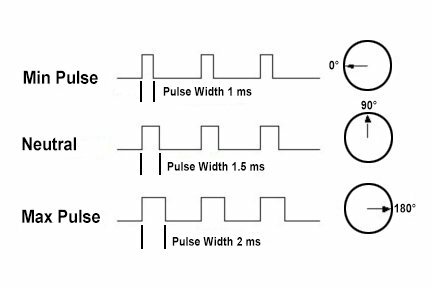 Read the Arduino Servo examples for more information on usage of the servo library and control of servos, etc. Not all Servos are perfectly built. One can get rid of the library itself; there is a way to make a servo turn by manually writing out the code. By trying out different delays for the first delayMicroseconds(), you can test out which delay you need for what position.